Freel Peak from Horse Meadows Trailhead (on Forest Road 51) via Armstrong Pass and the Tahoe Rim Trail. 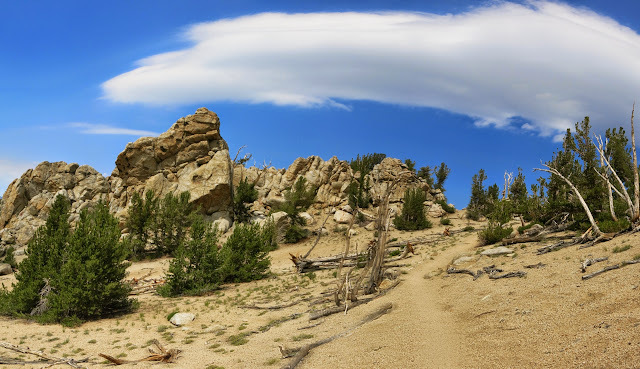 At 10881 ft, Freel is the highest-elevation peak in the Tahoe Basin. The trail is mostly well constructed and easy to follow, except for a few diverging use trails on the steep final ascent from Freel Saddle to the peak. This route is the closest approach, but requires a 4wd vehicle to reach the trailhead. Freel Peak is on the Tahoe OGUL Peak List, elevation rank #10. Trailhead directions: Take forest road 51 from California Hwy 89, 0.8 miles south/east of Luther Pass or 1.8 miles north/west of junction with Hwy 88 in Hope Valley. High clearance with 4WD is required on the dirt forest road to trailhead, with especially deep ruts 0.1 mile from highway requiring 4WD and reconnaissance. If your vehicle can pass that section, it can easily handle the following 3.3 miles to the trailhead.